I wanted so bad to draw my Danu Warrior in her ‘warm’ fash while it was lightly snowing like in the current event in CH. Only problem was, I had only drawn snow on the ground, and couldn’t figure out how to make it look like it was falling without the grey of the clouds mixing in with the flakes and making them look like baseballs rather than fluffy snowflakes. But then I found if I use my white pencil and draw the snowflakes first (pressing just a little harder than normal), and then go over it with grey, black, and lightish blue, they would hold their form and stand out in the clouds! Could also be applied to stars, I am most certain. Also wanted to see what the hood in Glenmor fash would look like over her head, and make the white edges look more like fur. So far happy with the results! IF YOU LOOK AT THIS YOU ARE A STALKER! 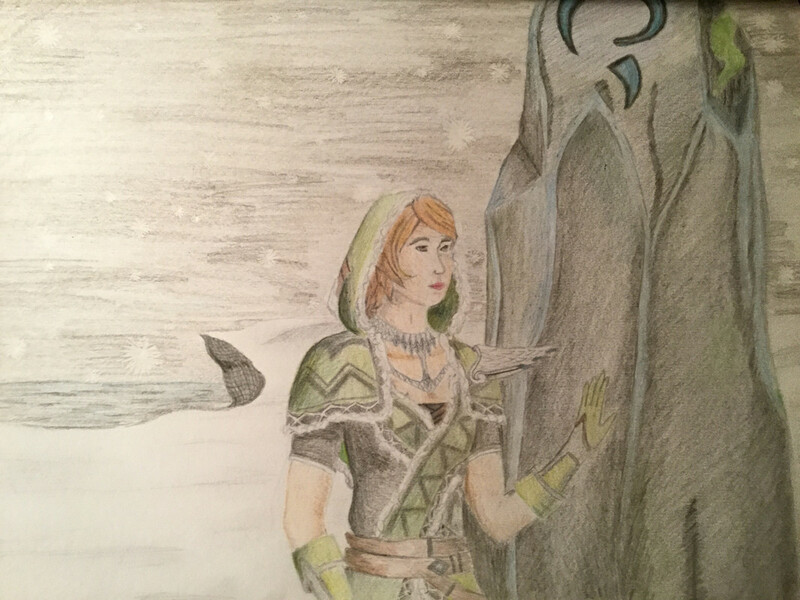 Another great piece Angmar! This one is my favorite yet. Difinitus wrote: Another great piece Angmar! This one is my favorite yet. Thank you Difinitus! All glory to God for giving me the ability to draw.